Sweet Charity will be brought to life by CQCM Bachelor of Theatre and Bachelor of Music students at the CQCM Theatre (Boundary Road, Mackay) from 19 April. 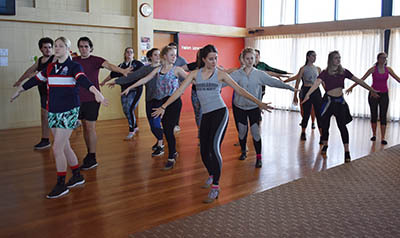 Rehearsals are in full swing at CQUni’s Central Queensland Conservatorium of Music (CQCM) with the first student production of 2018, Sweet Charity, set to dazzle Mackay audiences from 19-22 April. Directed by Caroline Kaspar – renowned for her direction and choreography work in Hot Shoe Shuffle, Chicago and Billy Elliot – the production will feature 37 CQCM Bachelor of Theatre and Bachelor of Music students in six scheduled performances. “On each of our shows, we welcome industry professionals who provide inspiration and expertise to showcase the talents of our students in acting, singing and dancing,” Nicole said. Based on an original screenplay by Federico Fellini, Sweet Charity is the story of a girl, Charity Hope Valentine, who always looks on the bright side of life, despite working in a rundown dance hall and putting up with a series of unreliable boyfriends. Playing the lead character of Charity is third-year Mackay Bachelor of Theatre student Sarah Dunn. Fresh from her role in a collaborative production of The M1K-A-D-0 in Kuala Lumpur, Sarah is enthusiastic about Sweet Charity’s CQCM debut. “This will be my sixth production with CQCM; the opportunity to play the role of Charity and work with Caroline so closely has been a wonderful experience,” Sarah said. Sweet Charity will be presented at the CQCM Theatre (Boundary Road, Mackay) on Thursday 19 April at 7.30 pm, Friday 20 April at 10.30 am and 7.30 pm, Saturday 21 April at 2 pm and 7.30 pm, and Sunday 22 April at 2 pm. Tickets are available via the CQCM website or phone 07 4940 7800.